Is there anything that could get any more romantic than getting married in one of the 7,107 islands in the Philippines? The country is filled with beautiful beaches, stunning views, and historical architecture across the archipelago that a bride-to-be will surely find one fit for her dream destination wedding. Just take cue from these five celebrity weddings whose choice of venues got us lost for words. There’s a reason Boracay has been named one of the best beaches in the world; its white, powdery sand and warm sunsets are what keeps locals and foreigners come back for more—probably also why Maxene Magalona and Rob Mananquil decided to tie the knot here. Their photos look like it was shot straight out of your favorite romcom movie. All photos by MangoRed Studios. Watch their wedding highlights here. The world has been taking notice of Palawan’s 50 shades of blue waters and amazing rock formations, so it didn’t come as a surprise when Bianca and JC Intal chose El Nido for their venue. The ceremony was held in the middle of lush greenery, and the reception by the shore—the perfect mix of intimate, peaceful, and serene. Apart from being home to the smallest active volcano, Tagaytay is also known for its not-so-hidden garden restaurants like Antonio’s, loved for its sophisticated interiors and exquisite dishes. 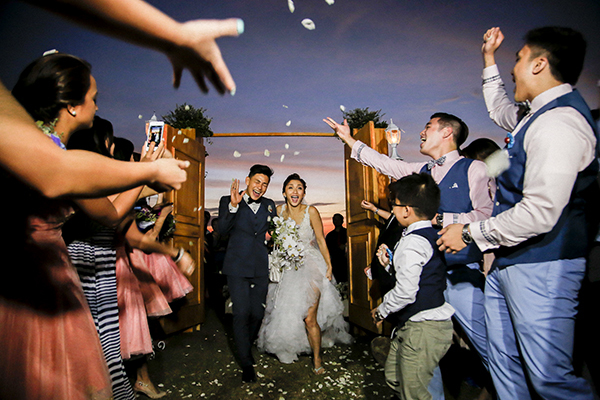 It was transformed into a charming secret garden for Bea Soriano and Eric Dee Jr.’s wedding, and the little girls in us are giddy about this real life fairytale scene. All photos by Bea Caisip via Bride and Breakfast. Balesin Island lets you enjoy international destinations within the comforts of the country as accommodations are themed with iconic destinations like St. Tropez. The island is exclusive for members so you can swim crystal clear waters in peace. It was like a royal wedding when Heart Evangelista and Chiz Escudero exchanged their I do’s here. The whole place looked like a luxurious floral wonderland. All photos by Pat Dy. If you want the beauty of a Philippine beach minus the hassle of a long travel, Batangas is a quick getaway from the city. 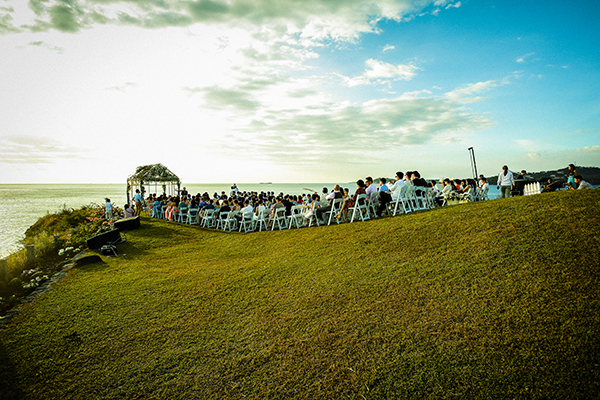 Iya Villania and Drew Arellano shared their vows on a cliff overlooking the bay, and the panoramic view behind them is the cherry on top. All photos by MangoRed via Bride and Breakfast. Want to gush over more celebrity destination weddings? Catch the premiere of She Said Yes 2 on April 4, 9:30 PM FOX Life Asia.